Through the eyes of two cute hopping mice, young readers will see what they get up to each night as they search for food and escape from hungry predators! Every night Lucky and Spike enjoy the spinifex seeds leftover from the local women who grind them to make bread but as we find out, they are not the only ones who are in search of food. 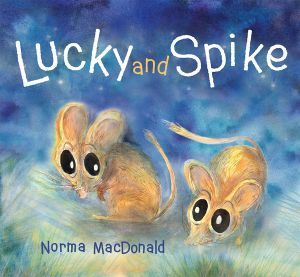 Lucky and Spike need to use their quick legs to escape a hungry feral cat and a barking owl but with the help of the camp dog and the sharp spinifex grass, they escape. Norma Macdonald's illustrations highlight the colours of the desert and the people who live there. The animals are full of life and we can see their movements over the pages as they hop, fly and run throughout the night. There is so much to enjoy about this book and so much to learn: it is a must for anyone interested not only in the diverse landscapes, people and animals of Australia, but also the need for better solutions for native species.